Less than 20 miles from the city centre lies the excavations of Ostia, the port of Rome and the first Roman colony. Positioned between the Tiber mouth and the Thyrrenian coast, Ostia always had a leading commercial role, the roman fleet was also stationed there. To visit the excavation of Ostia today means to go back in time. The old thoroughfare cuts across theaters, barracks, public baths, inns, shops to the main square where the temple major gods where. The Roman countryside is crawled with charming villages built on the slopes of the Alban Hills. Frascati with is famous villas built for the Roman patrician families to spend the summer as early as the 16th century; Castel Gandolfo the official pope’s summer residence; Marino renowned for the production of the white local wine; Nemi and Albano both overlooking volcanic lakes; Genzano with the flower carpet along the streets on the Corpus Christi day. The town of Tivoli has been chosen for the quality of the air and the luxurious vegetation by two illustrious men born centuries apart. The emperor Hadrian conceived his own residence and directly masterminded a small self sufficient town with edifices, temples, fountains theatres and an hippodrome surrounded by nature. The Cardinal Ippolito d’ Este , son of Lucrezia Borgia, turned an old convent into a lush villa with a beautiful landscape and more than a hundred of fountains, pools and water jets, establishing one the most important Italian gardens. Palestrina, the ancient Praeneste, founded 9 centuries before Christ, one of the richest and most powerful cities before Rome’s heyday. It is famous for its sanctuary dedicated to the goddess of fortune of a firstborn child (Fortuna Primigenia) dating back to the II B.C. It is also the namesake of composer Pierluigi da Palestrina, one of the the most famous in the Renaissance. 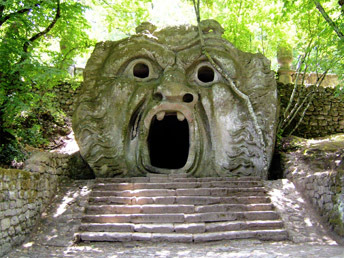 Bomarzo is a small medieval village in the heart of the Tuscia region, north of Rome, famous for its Park of the Monsters, a renaissance villa which is one of a kind: monsters, dragons, giants all cut in the local stone surprise and frighten the visitors in a an overgrown vegetation.